I love love LOVE that “equanimity” is often misused in yoga class instruction. In many cases, the teacher may have intended to cue the students to use the same variation of a pose on the left, as was used on the right. But a cue to cultivate equanimity gets into a deeper level of yoga practice, especially if the pose isn’t a particularly difficult one. Equanimity is needed, to stay steady in your efforts to balance in tree pose. Equanimity is also what guides you to choose one variation over another, in a simple twist. It’s a form of discipline: keeping at bay the myriad of impulses that may be coming at you, in the midst of your practice: staying the course. 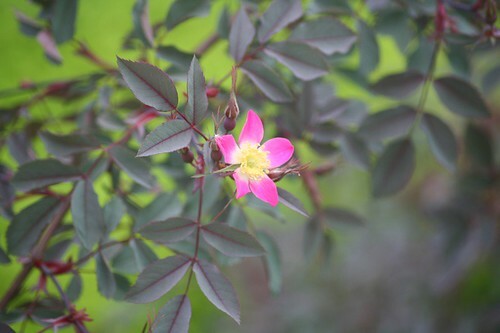 More on equanimity: the rose pictured above is the first rose we planted in our garden, here in Minnesota. It’s native to the mountains of central and southern Europe, and it lives quite happily in our climate of extremes.